Welcome to the Psychology Department Homepage! The Psychology program at ISU encourages a spirit of active inquiry and critical thinking, life-long learning and development and social responsibility. The curriculum is based on the premise that any student of psychology, regardless of program goals, should be well-informed about basic principles of behavior. The undergraduate degree in psychology prepares students for graduate studies in psychology and related fields as well as employment in a variety of settings including health services, research, government and business. The Department of Psychology offers both undergraduate and graduate programs. Our graduate programs include a Master's (M.A./M.S.) 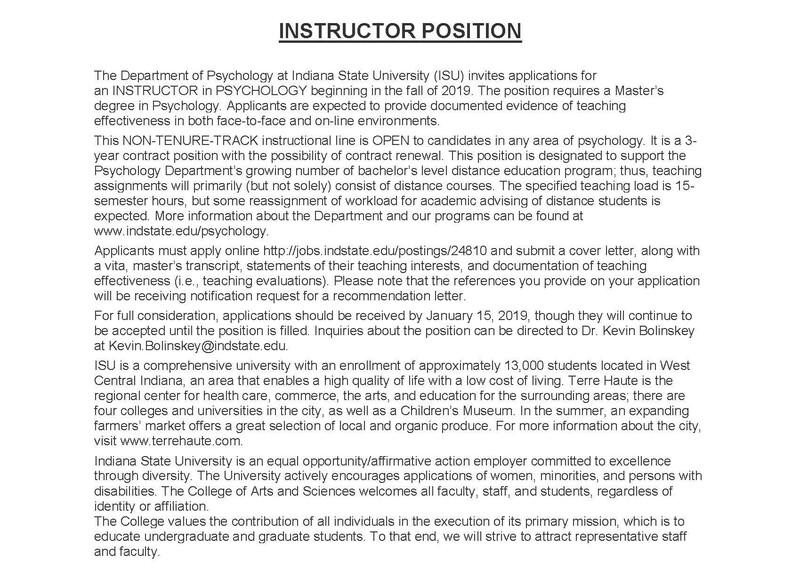 in General Psychology and an APA-accredited Doctoral program (Psy.D.) in Clinical Psychology*. 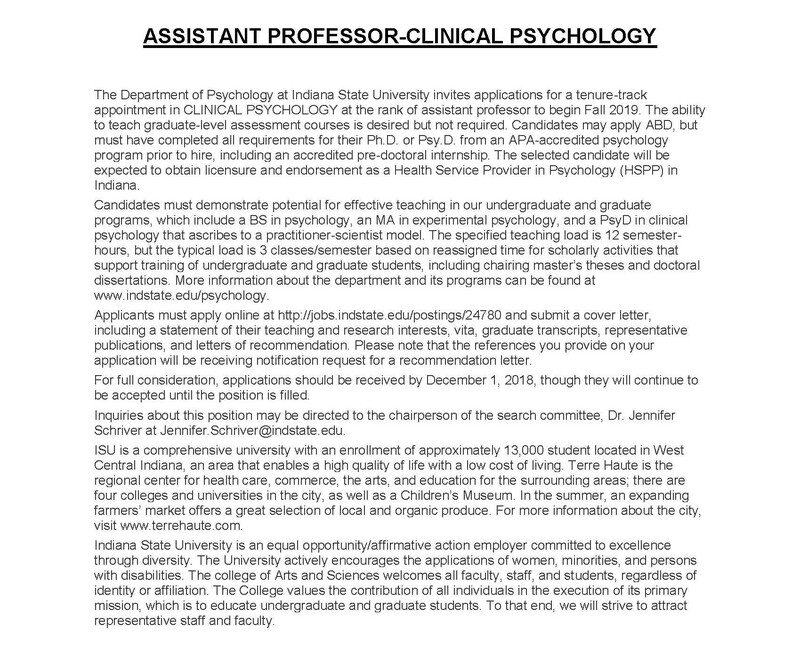 We also have a Psychology Clinic that provides services to students and members of the Terre Haute community. Are you a student interested in learning more about our graduate programs in Experimental Psychology or Clinical Psychology? Please take a moment and read an informational letter from our Department's chairperson, Dr. Virgil Sheets. The Department of Psychology assists students to achieve their personal and professional potential through training in scientific methods and discipline-specific knowledge, promoting a spirit of active inquiry and critical thought, and fostering a sense of social responsibility. 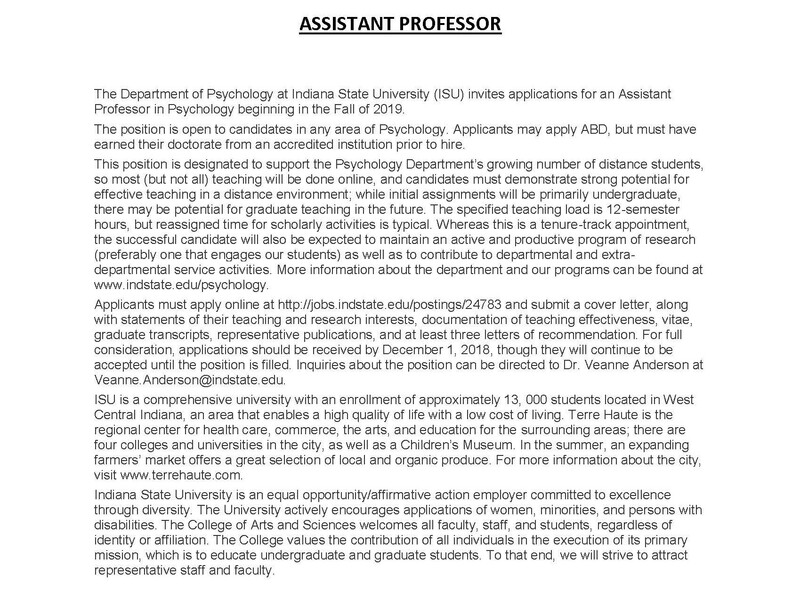 Currently the Psychology Department has 3 positions open for a Instructor, Assistant Professor and an Assistant Professor in Clinical Psychology. If you find a broken link, or if you have any suggestions for how we can improve the site, please email one of the web developers: Dr. Liz O'Laughlin (Elizabeth.O'Laughlin@indstate.edu) or Kim Julian (Kim.Julian@indstate.edu) or Emilie (Emilie.McFaddin@indstate.edu). We appreciate your feedback!